***Disclosure-Sample copy was received for review. All opinions stated are our own based on our personal experience. The adventurous and fun-loving Chuck and his best friends — Digger, Handy, Rowdy, Biggs, Boomer and Flip — are at it again with more free-wheelin’ escapades! My daughter loves Chuck and these trucks! Let’s get rolling! On June 3rd, 2014 Shout! 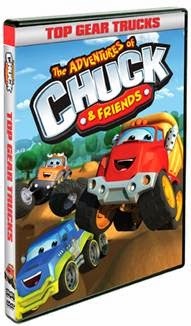 Factory Kids in collaboration with Hasbro Studios will release The Adventures of Chuck & Friends: Top Gear Trucks. The DVD features 10 exciting episodes as well as a bonus all-new sing-along. Watch Chuck and the gangs adventures, as they try to uncover the identity of a mysterious “ghost,” spend a day helping the town’s Mayor, re-create the night Chuck’s parents first met and more in these ten awesome adventures guaranteed to put fun into high gear! I have a little girl and she loves her trucks. I never thought she would be into Chuck and friends as much as she is. Now when she sees bulldozers and trucks, she shouts out "big trucks mami". I like the lessons each episode teaches. The episodes are so fun and entertaining. Recommended for the entire family to watch!